(CNS): Despite bing one of the youngest members of the Legislative Assembly and a back-bench government representative, Alva Suckoo is getting around government. 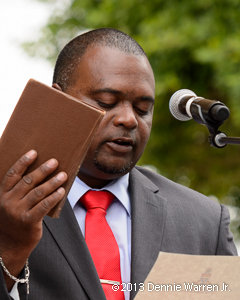 Having stepped in to take the reins at the Education and Employment Ministry recently, when both the minister, Tara Rivers, and her councillor, Winston Connolly, were overseas, he is now working alongside the health minister. Already appointed as a councillor in the premier’s Home Affairs Ministry, working on e-government and computer services, Suckoo will now also be working with his Bodden Town colleague, Osbourne Bodden, focusing on sports, youth and culture. Bodden said he was happy to share his workload with his constituency colleague. “He shares some of my passions in those areas and he’s already been helping. He’s a very able and committed representative and he will add much to the good services we already provide in these areas,” the minister added. As a councillor, Suckoo will attend meetings and events for Bodden. His appointment was made official Friday and announced in Tuesday’s Cabinet. During the same meeting all the new ministers were sworn in as Justices of the Peace and have been undergoing training for the role. Most right-thinking, patriotic people in the Cayman Islands wish Mr Suckoo well. However, I would have preferred that he was assigned to the Health segment of the Ministry because that is the area which has the greatest potential for Govt savings and, great potential to assist those with private health insurance to get a reasonable deal at a reasonable premium. I wish Mr Suckoo were re-assigned to Health. These two are on the crazy train, barking at the wrong moon. Why has the dump not been dealt with yet? Al Suckoo has good intentions not only for Bodden Town but for the people of Cayman. He is eager to implement a lot of his ideas and thus far has proven to be committed and most of all loyal. Al put your people first as you have been and like the other commenter said Ozzie and you will be the first and second elected in BT. Go get em boys!!!! Let's get Cayman back on track and Caymanians back to work. Maybe now Ossie can concentrate on the real problem he faces…. THE DUMP. C'mon guys, let's make some sort of progress like your politicial party namesake insinutates! It would have been nice to have a Ministry of Culture representative present at The Harquail Theater for The Cayman Music and Entertainment Association's(CMEA) 6th annual MUZAIC. There is a lot of work that needs to be done in the district of BT and yet, nobody seems to be around…………I don't even know when my elected members hold "office hours" for their people to come and see them………..
Perhaps you should call the Bodden Town Office on 943-7652. Just wondering if the new appointments is to shut him up? After all he was recently seeking employment for caymanians and all of sudden he's quiet on the subject. I went to see him and he spent 30 minutes talking to me and discussing my options, he was very helpful and I am now waiting to hear back on a job he referred me to. There were two other people there waiting to see him when I went there. Obviously you are being recognized for your ability to contribute at a high level and we look forward to your leadership. In BT I predict Ossie Bodden – 1st Elected and Al Suckoo 2nd Elected in 2017. I wish them well. Al I am so happy to see that you are trying to use your abilities to assist the people of this country. I am also glad to see that Ossie realises that you have much to offer. Remember God's favour is on you and no one can change that. Always do your best and when you leave politics leave with the same integrity and honesty and other great characteristics that you entered with. We always remember you in our prayers. Al wants to make a real positive impact for people. That however will come at a cost politically from within. Ok Alva lets see what will get done in Bodden Town and especially helping people who can work and need a jpb. Ozzie and Alva can start by letting Dart put the Waste mangement facility in Breakers. This would bring into the district more jobs than you all can handle. Maybe those in bodden town who can work should come to town and find one and not since on the beach waiting for one to drop in their laps? Sadly neither Alva, Tara, or Winston have actually spent ANY time in the NWDA offices so this is still all lip service. WHEN can we expect one of them to actually roll up their sleeves, dig in, and lead instead of talk, talk, talk? How can Ministers be Justices of the Peace? The conflict of interest in this is astonishing which is why I suspect you will not find it happening in serious jurisdictions (as opposed to our rinky dink place). 19:06 has a point. It would be easy for an unscrupulous MLA to sign something for a constituent in return for a vote – a variation on the loads of fill delivered at election time. In the case of honest MLAs, it puts them in a difficult position. How can they refuse a constituent's request for JP services? Why not. prey tell!! A least the group that are ministers now is smart enough to know what to sign from what not to sign. I can see no real issue with the appointments. In response to Why not. Prey tell!! There is a long and very well established understanding that the legislators and the judiciary have conflicting interests. The legislators need their eyes wide open to keep their voters sweet and ensure they stay in power – the judiciary work under an oath that believes justice is blind. Either you can see or you can't – there should be no peeking from under the blindfold to make sure friends stay safe! 14:50, you don't have a clue, do you?